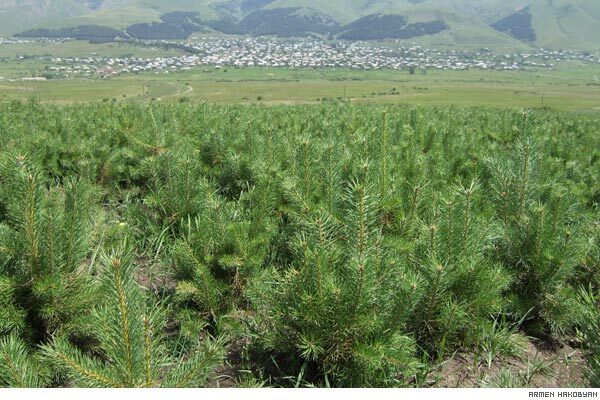 Beginning next year the seedling nursery of the Armenian Tree Project located in the village of Margahovit, Lori province, about 120 kilometers from Yerevan, will provide 1 million trees every year. The saplings grown on the land lot in 12 hectares will be planted both in the neighboring forests and be given to various communities to organize tree planting on the spot. “We will be using these trees grown in the seed-plot created in 2005 to forest the mountains and the hills in the north of Armenia, particularly in Lori,” says the director of ATP Mher Sadoyan, adding the organization’s gratitude to the Boston-based patrons Robert and Muriel Miraks, who granted $260,000 to create the ground. Sister and brother Miraks for the first time visited Margahovit several days ago to see the seed-plot holding their last name and cut the ribbon on the memorial board to their parents. “My parents were residents of Arabkir (Western Armenia) who narrowly escaped the genocide. They came to America after WWI. My father was very smart and lucky. Still young, he changed his name Zaven Mirakyan to John Mirak to succeed in business. But the name never became an obstacle for him to always think of the fatherland,” says Robert Mirak adding his father had a special love for trees as a true Armenian. That was the reason he planted 4 trees in his garden calling them the names of his 4 children. “We decided to create this ground after their [the parents’] death for their memory to symbolize all their love for the native nature. I wish they were by our side now and could see what we see,” says John Mirak’s son, the owner of the Arlington Center Garage and Service Corporation, who has now enlarged the business with his two other brothers heading the Mirak Chevrolet/Hyundai, Mirak Properties and Mirak Leasing companies. Mher Sadoyan hopes the proper development of the work they have begun will increase the scale and the number of spheres the Miraks invest in and will include also business projects. “By this kind of programs will also create jobs facilitating the reduction of poverty in the villages, we educate people, particularly children,” explains the deputy director of ATP Jason Soghikian. 30-40 of the 4,200 population in Margahovit have been working in the seed-plot since early spring. “Yes, the program has a strategic meaning, but the most important thing in these circumstances is the creation of jobs. The next most important thing is that we manage to restore the logged forests and pass on to our children. Who knows if a crisis like that of the 90s happens, our children may need the wood,” says the head of the village Seyran Ananyan. The ATP launched poverty reduction initiatives in 2003 in the village of Aygut, where, the representatives of the organization say, there are plenty of both environmental and social problems; for instance, there was gas in the village but the residents were unable to pay to get it in their homes. “Studying the situation there, we decided to organize mini seeding plots by each house. People grow the seedlings and sell them to us. The same workforce is used in the forests. This provides the people with permanent jobs,” explains Bella Avetisyan, the ATP public relations coordinator. She adds the organization hires an average of 300-500 people in different provinces on a season basis to plant trees with a salary of 45,000 drams ($150). Seeding grounds have been set by the houses of more than 250 families in the villages of Aygut and Aghavnavank in Gegharkunik and Tavush. The ATP program of creating by-house seeding-plots targeted at small business promotion has been recognized this year national winner of the Energy Globe Awards among 853 projects from 109 countries. The representatives of the organization, who received the special honorary award in Brussels, are proud to tell about the award mentioning it is an unprecedented acknowledgement of their work. “However, the officials of Armenia never properly responded to the news,” says Avetisyan. The ATP founded in 1994 has passed the threshold of 2 million plantings this year restoring forests in Gegharkunik, Lori and Tavush. There are plans to include other provinces of Armenia in the coming years. “The cornerstone of founding such an organization and initiating such program was the energy crisis of the 90s and the business that evolved later in the sphere – both resulting in wide spread forest loggings and vanishing forests in Armenia,” Sadoyan represents the situation adding the organization had only 3-4 workers at the beginning with the number reaching to 80 today. This year’s budget of the ATP is $1.5 million comprised of both the big sums donated by 3,000-5,000 donors from the Diaspora. “Community members and heads also help us. The Ministry of Education and Science supports us in terms of organizing environmental education. It has particularly helped us with getting the document that the textbook of environmental education created by the ATP has been approved by the National Institute of Education. This means the book will be used in schools,” underlines Sadoyan. He says ATP will also be cooperating with Yale University. The school of forestry of the university helps it in making plans for forest restoration. “The university will submit us the plan this autumn that will be distributed to the communities after the government approves it as it plans to hand the management of forests to the communities,” emphasizes Sadoyan.